Einsteinium is a synthetic element with symbol Es and atomic number 99. It is the seventh transuranic element, and an actinide. Einsteinium was discovered as a component of the debris of the first hydrogen bomb explosion in 1952, and named after Albert Einstein. Its most common isotope einsteinium-253 (half life 20.47 days) is produced artificially from decay of californium-253 in a few dedicated high-power nuclear reactors with a total yield on the order of one milligram per year. The reactor synthesis is followed by a complex process of separating einsteinium-253 from other actinides and products of their decay. Other isotopes are synthesized in various laboratories, but at much smaller amounts, by bombarding heavy actinide elements with light ions. Owing to the small amounts of produced einsteinium and the short half-life of its most easily produced isotope, there are currently almost no practical applications for it outside of basic scientific research. 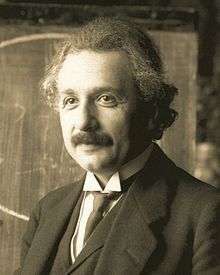 In particular, einsteinium was used to synthesize, for the first time, 17 atoms of the new element mendelevium in 1955. Einsteinium is a soft, silvery, paramagnetic metal. Its chemistry is typical of the late actinides, with a preponderance of the +3 oxidation state; the +2 oxidation state is also accessible, especially in solids. The high radioactivity of einsteinium-253 produces a visible glow and rapidly damages its crystalline metal lattice, with released heat of about 1000 watts per gram. Difficulty in studying its properties is due to einsteinium-253's decay to berkelium-249 and then californium-249 at a rate of about 3% per day. The isotope of einsteinium with the longest half life, einsteinium-252 (half life 471.7 days) would be more suitable for investigation of physical properties, but it has proven far more difficult to produce and is available only in minute quantities, and not in bulk. Einsteinium is the element with the highest atomic number which has been observed in macroscopic quantities in its pure form, and this was the common short-lived isotope einsteinium-253. Some 238U atoms, however, could absorb another two neutrons (for a total of 17), resulting in 255Es, as well as in the 255Fm isotope of another new element, fermium. The discovery of the new elements and the associated new data on multiple neutron capture were initially kept secret on the orders of the U.S. military until 1955 due to Cold War tensions and competition with Soviet Union in nuclear technologies. However, the rapid capture of so many neutrons would provide needed direct experimental confirmation of the so-called r-process multiple neutron absorption needed to explain the cosmic nucleosynthesis (production) of certain heavy chemical elements (heavier than nickel) in supernova explosions, before beta decay. Such a process is needed to explain the existence of many stable elements in the universe. In their discovery of the elements 99 and 100, the American teams had competed with a group at the Nobel Institute for Physics, Stockholm, Sweden. 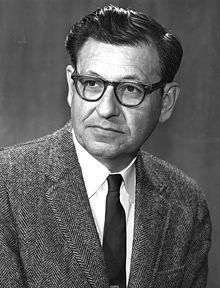 In late 1953 – early 1954, the Swedish group succeeded in the synthesis of light isotopes of element 100, in particular 250Fm, by bombarding uranium with oxygen nuclei. These results were also published in 1954. Nevertheless, the priority of the Berkeley team was generally recognized, as its publications preceded the Swedish article, and they were based on the previously undisclosed results of the 1952 thermonuclear explosion; thus the Berkeley team was given the privilege to name the new elements. 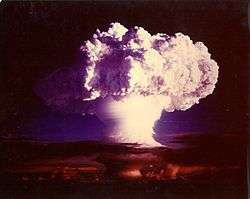 As the effort which had led to the design of Ivy Mike was codenamed Project PANDA, element 99 had been jokingly nicknamed "Pandamonium" but the official names suggested by the Berkeley group derived from two prominent scientists, Albert Einstein and Enrico Fermi: "We suggest for the name for the element with the atomic number 99, einsteinium (symbol E) after Albert Einstein and for the name for the element with atomic number 100, fermium (symbol Fm), after Enrico Fermi." Both Einstein and Fermi died before the names were announced. The discovery of these new elements was announced by Albert Ghiorso at the first Geneva Atomic Conference held on 8–20 August 1955. The symbol for einsteinium was first given as "E" and later changed to "Es" by IUPAC. Magnetic properties have been studied for einsteinium metal, its oxide and fluoride. All three materials showed Curie–Weiss paramagnetic behavior from liquid helium to room temperature. The effective magnetic moments were deduced as 10.4 ± 0.3 µB for Es2O3 and 11.4 ± 0.3 µB for the EsF3, which are the highest values among actinides, and the corresponding Curie temperatures are 53 and 37 K.
Like all actinides, einsteinium is rather reactive. Its trivalent oxidation state is most stable in solids and aqueous solution where it induced pale pink color. The existence of divalent einsteinium is firmly established, especially in solid phase; such +2 state is not observed in many other actinides, including protactinium, uranium, neptunium, plutonium, curium and berkelium. Einsteinium(II) compounds can be obtained, for example, by reducing einsteinium(III) with samarium(II) chloride. The oxidation state +4 was postulated from vapor studies and is yet uncertain. Einsteinium has a high rate of nuclear fission that results in a low critical mass for a sustained nuclear chain reaction. This mass is 9.89 kilograms for a bare sphere of 254Es isotope, and can be lowered to 2.9 by adding a 30 centimeter thick steel neutron reflector, or even to 2.26 kilograms with a 20 cm thick reflector made of water. However, even this small critical mass greatly exceeds the total amount of einsteinium isolated thus far, especially of the rare 254Es isotope. Because of the short half-life of all isotopes of einsteinium, any primordial einsteinium, that is einsteinium that could possibly be present on the Earth during its formation, has decayed by now. Synthesis of einsteinium from naturally occurring actinides uranium and thorium in the Earth crust requires multiple neutron capture, which is an extremely unlikely event. Therefore, most einsteinium is produced on Earth in scientific laboratories, high-power nuclear reactors, or in nuclear weapons tests, and is present only within a few years from the time of the synthesis. The transuranic elements from americium to fermium, including einsteinium, occurred naturally in the natural nuclear fission reactor at Oklo, but no longer do so. Einsteinium was observed in Przybylski's Star in 2008. 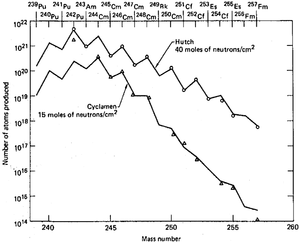 Heavy neutron irradiation of plutonium results in four major isotopes of einsteinium: 253Es (α-emitter with half-life of 20.03 days and with a spontaneous fission half-life of 7×105 years); 254mEs (β-emitter with half-life of 38.5 hours), 254Es (α-emitter with half-life of about 276 days) and 255Es (β-emitter with half-life of 24 days). An alternative route involves bombardment of uranium-238 with high-intensity nitrogen or oxygen ion beams. 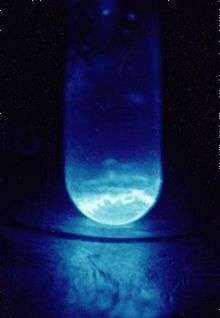 The isotope 248Es was produced by irradiating 249Cf with deuterium ions. It mainly decays by emission of electrons to 248Cf with a half-life of 25 (±5) minutes, but also releases α-particles of 6.87 MeV energy, with the ratio of electrons to α-particles of about 400. There is almost no use for any isotope of einsteinium outside of basic scientific research aiming at production of higher transuranic elements and transactinides. 1 2 3 4 5 6 7 Ghiorso, Albert (2003). "Einsteinium and Fermium". Chemical and Engineering News. 81 (36): 174–175. doi:10.1021/cen-v081n036.p174. ↑ Ghiorso, Albert; Rossi, G. Bernard; Harvey, Bernard G. & Thompson, Stanley G. (1954). "Reactions of U-238 with Cyclotron-Produced Nitrogen Ions". Physical Review. 93 (1): 257. Bibcode:1954PhRv...93..257G. doi:10.1103/PhysRev.93.257. ↑ Harvey, Bernard; Thompson, Stanley; Ghiorso, Albert; Choppin, Gregory (1954). "Further Production of Transcurium Nuclides by Neutron Irradiation". Physical Review. 93 (5): 1129. Bibcode:1954PhRv...93.1129H. doi:10.1103/PhysRev.93.1129. ↑ Studier, M.; Fields, P.; Diamond, H.; Mech, J.; Friedman, A.; Sellers, P.; Pyle, G.; Stevens, C.; Magnusson, L.; Huizenga, J. (1954). "Elements 99 and 100 from Pile-Irradiated Plutonium". Physical Review. 93 (6): 1428. Bibcode:1954PhRv...93.1428S. doi:10.1103/PhysRev.93.1428. ↑ Fields, P.; Studier, M.; Mech, J.; Diamond, H.; Friedman, A.; Magnusson, L.; Huizenga, J. (1954). "Additional Properties of Isotopes of Elements 99 and 100". Physical Review. 94: 209–210. Bibcode:1954PhRv...94..209F. doi:10.1103/PhysRev.94.209. ↑ Thompson, S. G.; Harvey, B. G.; Choppin, G. R.; Seaborg, G. T. (1954). "Chemical Properties of Elements 99 and 100". Journal of the American Chemical Society. 76 (24): 6229–6236. doi:10.1021/ja01653a004. ↑ Atterling, Hugo; Forsling, Wilhelm; Holm, Lennart; Melander, Lars; Åström, Björn (1954). "Element 100 Produced by Means of Cyclotron-Accelerated Oxygen Ions". Physical Review. 95 (2): 585–586. Bibcode:1954PhRv...95..585A. doi:10.1103/PhysRev.95.585.2. ↑ Richard Lee Miller (1991). Under the cloud: the decades of nuclear testing. Two-Sixty Press. p. 115. ISBN 1-881043-05-3. ↑ John McPhee (1980). The Curve of Binding Energy. Farrar, Straus & Giroux Inc. p. 116. ISBN 0-374-51598-0. ↑ Both died between the time the names were originally proposed and when they were announced. ↑ Seaborg, G.T. (1994) Modern alchemy: selected papers of Glenn T. Seaborg, World Scientific, p. 6, ISBN 981-02-1440-5. ↑ Haire, R. G. (1990) "Properties of the Transplutonium Metals (Am-Fm)", in: Metals Handbook, Vol. 2, 10th edition, (ASM International, Materials Park, Ohio), pp. 1198–1201. 1 2 Haire, R (1986). "Preparation, properties, and some recent studies of the actinide metals". Journal of the Less Common Metals. 121: 379–398. doi:10.1016/0022-5088(86)90554-0. ↑ Kleinschmidt, Phillip D.; Ward, John W.; Matlack, George M.; Haire, Richard G. (1984). "Henry's Law vaporization studies and thermodynamics of einsteinium-253 metal dissolved in ytterbium". The Journal of Chemical Physics. 81: 473. Bibcode:1984JChPh..81..473K. doi:10.1063/1.447328. 1 2 3 Ensor, D.D. ; Peterson, J.R.; Haire, R.G. ; Young, J.P. (1981). "Absorption spectrophotometric study of 253EsF3 and its decay products in the bulk-phase solid state". Journal of Inorganic and Nuclear Chemistry. 43 (10): 2425–2427. doi:10.1016/0022-1902(81)80274-6. 1 2 3 Haire, R.G. ; Baybarz, R.D. (1973). "Identification and analysis of einsteinium sesquioxide by electron diffraction". Journal of Inorganic and Nuclear Chemistry. 35 (2): 489–496. doi:10.1016/0022-1902(73)80561-5. ↑ Huray, P; Nave, S; Haire, R (1983). "Magnetism of the heavy 5f elements". Journal of the Less Common Metals. 93 (2): 293–300. doi:10.1016/0022-5088(83)90175-3. ↑ Huray, Paul G.; Nave, S.E. ; Haire, R.G. ; Moore, J.R. (1984). "Magnetic Properties of Es2O3 and EsF3". Inorganica Chimica Acta. 94: 120–122. doi:10.1016/S0020-1693(00)94587-0. ↑ Ahmad, I; Wagner, Frank (1977). "Half-life of the longest-lived einsteinium isotope-252Es". Journal of Inorganic and Nuclear Chemistry. 39 (9): 1509–1511. doi:10.1016/0022-1902(77)80089-4. ↑ McHarris, William; Stephens, F.; Asaro, F.; Perlman, I. (1966). "Decay Scheme of Einsteinium-254". Physical Review. 144 (3): 1031–1045. Bibcode:1966PhRv..144.1031M. doi:10.1103/PhysRev.144.1031. ↑ Audi, G; Bersillon, O.; Blachot, J.; Wapstra, A.H. (1997). 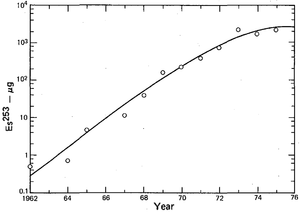 "The NUBASE evaluation of nuclear and decay properties" (PDF). Nuclear Physics A. 624: 1–124. Bibcode:1997NuPhA.624....1A. doi:10.1016/S0375-9474(97)00482-X. ↑ "Identification of absorption lines of short half-life actinides in the spectrum of Przybylski's star (HD 101065)". Kinematics and Physics of Celestial Bodies. 24: 89–98. doi:10.3103/S0884591308020049. ↑ Радионуклидные источники и препараты (in Russian). Research Institute of Atomic Reactors. Retrieved 2010-09-26. ↑ Hoffman, Darleane C.; Ghiorso, Albert and Seaborg, Glenn Theodore (2000) The Transuranium People: The Inside Story, Imperial College Press, pp. 190–191, ISBN 978-1-86094-087-3. ↑ Jones, M.; Schuman, R.; Butler, J.; Cowper, G.; Eastwood, T.; Jackson, H. (1956). 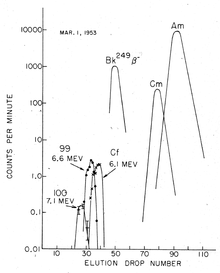 "Isotopes of Einsteinium and Fermium Produced by Neutron Irradiation of Plutonium". Physical Review. 102: 203–207. Bibcode:1956PhRv..102..203J. doi:10.1103/PhysRev.102.203. ↑ Guseva, L; Filippova, K; Gerlit, Y; Druin, V; Myasoedov, B; Tarantin, N (1956). "Experiments on the production of einsteinium and fermium with a cyclotron". Journal of Nuclear Energy (1954). 3 (4): 341–346. doi:10.1016/0891-3919(56)90064-X. ↑ Harry H. Binder: Lexikon der chemischen Elemente, S. Hirzel Verlag, Stuttgart 1999, ISBN 3-7776-0736-3, pp. 18–23. ↑ Chetham-Strode, A.; Holm, L. (1956). "New Isotope Einsteinium-248". Physical Review. 104 (5): 1314. Bibcode:1956PhRv..104.1314C. doi:10.1103/PhysRev.104.1314. ↑ Harvey, Bernard; Chetham-Strode, Alfred; Ghiorso, Albert; Choppin, Gregory; Thompson, Stanley (1956). "New Isotopes of Einsteinium". Physical Review. 104 (5): 1315–1319. Bibcode:1956PhRv..104.1315H. doi:10.1103/PhysRev.104.1315. ↑ Kulyukhin, S; Auerman, L.N. ; Novichenko, V.L. ; Mikheev, N.B. ; Rumer, I.A. ; Kamenskaya, A.N. ; Goncharov, L.A.; Smirnov, A.I. (1985). "Production of microgram quantities of einsteinium-253 by the reactor irradiation of californium". Inorganica Chimica Acta. 110: 25–26. doi:10.1016/S0020-1693(00)81347-X. ↑ United States Nuclear Tests July 1945 through September 1992, DOE/NV--209-REV 15, December 2000. 1 2 Hall, Nina (2000). The new chemistry. Cambridge University Press. pp. 9–11. ISBN 0-521-45224-4. 1 2 3 Haire, R. G. & Eyring, L. (1994). "Lanthanides and Actinides Chemistry". In K.A. Gscheidner, Jr.; et al. Handbook on the Physics and Chemistry of Rare Earths. 18. North-Holland, New York. pp. 414–505. ISBN 0-444-81724-7. ↑ Kleinschmidt, P (1994). "Thermochemistry of the actinides". Journal of Alloys and Compounds. 213–214: 169–172. doi:10.1016/0925-8388(94)90898-2. ↑ Fujita, D; Cunningham, B.B. ; Parsons, T.C. (1969). "Crystal structures and lattice parameters of einsteinium trichloride and einsteinium oxychloride". Inorganic and Nuclear Chemistry Letters. 5 (4): 307–313. doi:10.1016/0020-1650(69)80203-5. ↑ Fellows, R; Peterson, J.R.; Noé, M.; Young, J.P.; Haire, R.G. (1975).  "X-ray diffraction and spectroscopic studies of crystalline einsteinium(III) bromide, 253EsBr3". Inorganic and Nuclear Chemistry Letters. 11 (11): 737–742. doi:10.1016/0020-1650(75)80090-0. 1 2 3 4 5 Young, J. P.; Haire, R. G.; Peterson, J. R.; Ensor, D. D.; Fellow, R. L. (1981). "Chemical consequences of radioactive decay. 2. Spectrophotometric study of the ingrowth of berkelium-249 and californium-249 into halides of einsteinium-253". Inorganic Chemistry. 20 (11): 3979–3983. doi:10.1021/ic50225a076. ↑ Young, J. P.; Haire, R. G.; Fellows, R. L.; Peterson, J. R. (1978). "Spectrophotometric studies of transcurium element halides and oxyhalides in the solid state". Journal of Radioanalytical Chemistry. 43 (2): 479–488. doi:10.1007/BF02519508. ↑ Fujita, D; Cunningham, B.B. ; Parsons, T.C. ; Peterson, J.R. (1969). "The solution absorption spectrum of Es3+". Inorganic and Nuclear Chemistry Letters. 5 (4): 245–250. doi:10.1016/0020-1650(69)80192-3. ↑ Fellows, R.L. ; Young, J.P.; Haire, R.G. and Peterson J.R. (1977) in: GJ McCarthy and JJ Rhyne (eds) The Rare Earths in Modern Science and Technology, Plenum Press, New York, pp. 493–499. ↑ Young, J.P.; Haire R.G., Fellows, R.L. ; Noe, M. and Peterson, J.R. (1976) "Spectroscopic and X-Ray Diffraction Studies of the Bromides of Californium-249 and Einsteinium-253", in: W. Müller and R. Lindner (eds.) Plutonium 1975, North Holland, Amsterdam, pp. 227–234. ↑ Nugent, Leonard J.; Burnett, J. L.; Baybarz, R. D.; Werner, George Knoll; Tanner, S. P.; Tarrant, J. R.; Keller, O. L. (1969). "Intramolecular energy transfer and sensitized luminescence in actinide(III) .beta.-diketone chelates". The Journal of Physical Chemistry. 73 (5): 1540–1549. doi:10.1021/j100725a060. ↑ Beitz, J; Wester, D; Williams, C (1983). "5f state interaction with inner coordination sphere ligands: Es3+ ion fluorescence in aqueous and organic phases". Journal of the Less Common Metals. 93 (2): 331–338. doi:10.1016/0022-5088(83)90178-9. ↑ It's Elemental – The Element Einsteinium. Retrieved 2 December 2007. ↑ Ghiorso, A.; Harvey, B.; Choppin, G.; Thompson, S.; Seaborg, G. (1955). "New Element Mendelevium, Atomic Number 101". Physical Review. 98 (5): 1518–1519. Bibcode:1955PhRv...98.1518G. doi:10.1103/PhysRev.98.1518. ISBN 978-981-02-1440-1. ↑ Schadel, M; Bruchle, W; Brugger, M; Gaggeler, H; Moody, K; Schardt, D; Summerer, K; Hulet, E; Dougan, A; Dougan, R; Landrum, J; Lougheed, R; Wild, J; O'Kelley, G; Hahn, R (1986). "Heavy isotope production by multinucleon transfer reactions with 254Es". Journal of the Less Common Metals. 122: 411–417. doi:10.1016/0022-5088(86)90435-2. ↑ Lougheed, R. W.; Landrum, J. H.; Hulet, E. K.; Wild, J. F.; Dougan, R. J.; Dougan, A. D.; Gäggeler, H.; Schädel, M.; Moody, K. J.; Gregorich, K. E. & Seaborg, G. T. (1985). "Search for superheavy elements using 48Ca + 254Esg reaction". Physical Review C. 32 (5): 1760–1763. Bibcode:1985PhRvC..32.1760L. doi:10.1103/PhysRevC.32.1760. ↑ Turkevich, A. L.; Franzgrote, E. J.; Patterson, J. H. (1967). "Chemical Analysis of the Moon at the Surveyor V Landing Site". Science. 158 (3801): 635–637. Bibcode:1967Sci...158..635T. doi:10.1126/science.158.3801.635. PMID 17732956. ↑ International Commission on Radiological Protection (1988). Limits for intakes of radionuclides by workers, Part 4. 19. Elsevier Health Sciences. pp. 18–19. ISBN 0-08-036886-7.